Like the other great piano players of our time, Enrico Pieranunzi mostly performs and records in trio and solo formats. Tales From the Unexpected comes from a concert in Gütersloh, Germany, in 2015, and is a valuable addition to his large, rich trio discography. The bassist and drummer, Jasper Somsen and André Ceccarelli, are longtime occasional collaborators. It is a rare recent example of a live jazz album recorded on analog tape direct to two-track. The sound is wonderfully warm and alive. 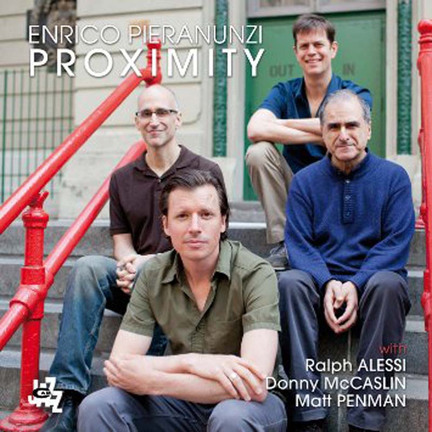 Proximity is even more noteworthy because it is a departure for Pieranunzi, a studio session from 2013 by a new quartet with trumpeter Ralph Alessi, saxophonist Donny McCaslin and bassist Matt Penman. Pieranunzi wrote all the material on both albums. He is a special interpreter of standards, so it is slightly disappointing that he did not choose to include even one. But he is a composer who creates enticing melodies, and it is interesting how his tunes are able to serve very different purposes. Tales is all about energy. Tracks are mostly up (“The Surprise Answer”) or medium-up (“Anne Blomster Sang,” “Fellini’s Waltz”), and all feel driven by inner ensemble urgency. But Pieranunzi’s touch always informs energy with graceful elegance and Italian romanticism. His formal sense is so sure that even fully improvised pieces like “Improtale 1” sound refined, symmetrical and complete. The romanticism of Proximity is deeper and more plaintive. The title track and “Sundays” are melodies made from a few long, yearning calls that originate with Alessi and McCaslin. Their articulate voices and strong personalities sound submerged in Pieranunzi’s sensibility. Alessi draws out “(In)Canto” like a rapt ceremony, caught in its haunting theme, repeating it with subtle variations. In the open spaces, Pieranunzi lays in variations of his own, in luminous fragments. As for McCaslin, it is striking how he finds a way to take off from such a closed circle and solo, offering fresh, revelatory content. Throughout, Alessi and McCaslin play with measured, concentrated lyricism. Pieranunzi, who rarely arranges for horns, employs their instruments with precision. He thinks like a painter, brushing in his melodies with trumpet and saxophone in alternating or interlaced strokes. Then, within his own clear parameters, he allows those horns to briefly roam free in his songs. The most emotionally resonant piece is “Within the House of Night,” without solos as such. Its pensiveness passes beautifully through everyone’s hands, including those of Penman, whose probing, poetic work on this record reveals that he is one of the most gifted bassists currently working. The absence of a drummer makes Proximity a form of chamber jazz, but it never lacks for fervor. Though it may be a nonsensical thought, it's tempting to wonder if Kenny Werner has figured out how to clone himself. Lately, it would seem that he's everywhere: if you've opened the pages of DownBeat you've seen his "Zen And The Art Of Jazz" columns staring back at you; if you've headed up to Berklee you've seen him in action, acting as Artistic Director of that institution's Performance Wellness Institute; if you frequent New York's Blue Note or Jazz Standard you might've heard his new quintet or his longstanding trio; and if you've followed the new release schedule, you may have spotted the latest from that trio or trumpeter Randy Brecker's RandyPOP! (Piloo Records And Productions LLC, 2015), an album featuring Werner's playing and his arrangements/derangements of classic pop songs. How he fits it all in is a mystery, but it's clear that a Werner in motion gathers no moss. Now, in keeping with that idea, comes another release from the omnipresent pianist. 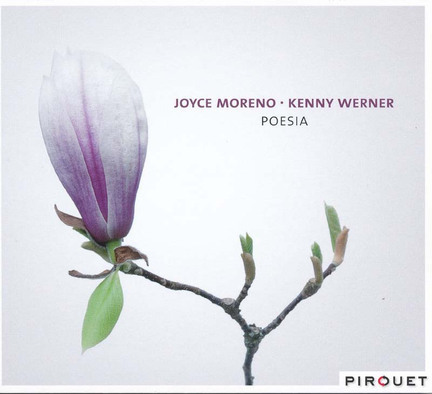 Poesia finds Werner working with vocalist Joyce Moreno, building on a musical relationship that extends back over a quarter of a century: Werner appeared on both of Moreno's albums on the Verve imprint, he toured Japan with her in 1991, and he remains her first choice pianist whenever she arrives in New York. Here, these two deliver thirteen intimate duo gems that are as lovely and distinctive as the budding and blooming flower images that adorn the packaging. Across this album, Werner and Moreno demonstrate that beauty comes in many forms. "Olha Maria" moves with melancholic charm, "Estate" comes across as a form of musical hypnotherapy, "Mad About The Boy" is a daydream and a saloon song rolled into one, and "Pra Dizer Adeus" reduces the whole concept of yearning into a single work. Virtually every one of these performance exists in a similar space in terms of tempo, dynamics, and pacing, but each piece of musical poetry carries a different intention. A number like "Velho Piano," for example, deals with the evolution and unmasking of love over time while a piece like "The Water Is Wide" comes from a different place, speaking in spiritual tones. Both deal with dissimilar topics, but they become kindred spirits in the way that Werner and Moreno address them. Not a year goes by without the arrival of one or two extraordinarily beautiful piano-and-voice duo albums. For 2015, this is one of them. To say that this music is affecting and enthralling would be a gross understatement. Second Love Song; E O Amor Outra Vez; Olha Maria; Estate; Mad About The Boy; Velho Piano; Throw It Away; Pra Dizer Adeus; Smile; Choro Bandido; Some Other Time; Novelo; The Water Is Wide. Joyce Moreno: vocals; Kenny Werner: piano. At home in Norway, pianist Eivind Austad is a household name in the young jazz scene in Bergen. Eivind is originally from Trondheim, way up north, but has made Bergen his home for the past 20 years. With “Moving” (out March 18th), his trio is now ready for an international career as well. And you could say better late than never. Eivind was also trained in classical music and folk, like it is common in the Scandinavian countries, and his love for soul, gospel and r&b makes this new effort an interesting listening experience. And his solo piano introduction on the album’s opener “Two Of Mine” show his very lyrical and Bill Evans-like approach until bassist Magne Thormodsaeter and drummer Hakon Mjaset Johansen join him in subdued and elegant fashion. Eivind’s right hand fathoms out the boundaries in all directions. The compositions don’t really have that typical Norwegian touch (if there is one), but explore and touch upon all kinds of genres, if only slightly, like on the ruminated, soulful search in “Median”. And some folksy elements shine through on the warm and comfy “Homeland”. The various layers on the tense and versatile “In The End”, again with remarkable right-hand work and some Keith Jarrett-like interpolations, make the piece well-rounded and carefully thought-through. There is a coherent final statement after a brief bass solo which is nicely embedded into the mix. The title track has some chamber-music like scales and remind me of some of Chick Corea‘s ECM works of the 70s. There is a swinging approach to “The Moment Of Truth” where Eivind is more or less telling a lively and enthralling story and gives room to Magne and Hakon as well. But the nice thing here is that the bass and drum solo parts are not necessarily full-grown solo spots per se, but more a part of the scheme of things, of the overall sound concept and composition. It’s the most satisfying and pulsating piece on offer, transparent and lucid. In addition to the six original compositions, there are two cover pieces by Cole Porter and David Bowie. Porter’s “All Of You” shows me quite plainly how important original material is. Not that there is no originality in the playing and interpretation of this classic, but it somehow falls short of the imaginative and at times brilliant ideas of the self-written pieces. Much more in sync with his own material is the choice of Bowie’s “Life On Mars” where Eivind’s playing gets severely ethereal, all vulnerable and bravely exposed.